I was able to fix the coffee grinder despite a tamper-resistant* screw securing the base (I filed a cheap hex driver to fit the screw). Using the modified hex driver, a spare power cord, soldering iron and a sanding block I was able to swap out the power cord and smooth the rough edged cord cover. My garage may be a mess, but I had all the needed tools and materials on hand! 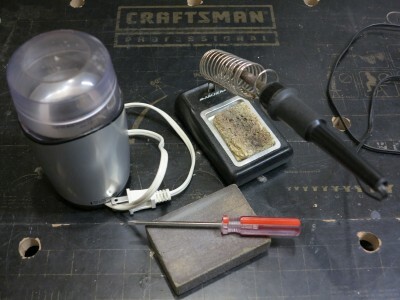 Was repairing the coffee grinder worthwhile? Fixing the coffee grinder took less than an hour which is about how long it would take to drive to the store, buy a replacement and drive home while griping about the experience. So, my time investment was the same, with no money out of pocket and I have the small satisfaction of repairing, instead of replacing, the coffee grinder. The remaining question is, how long will it last now?